Eurus Energy America Corporation is pleased to announce that its 180MW Bull Creek wind farm in Borden County, Texas has achieved commercial operation. It is the largest project completed by Eurus worldwide and is its eighth wind project in the United States. 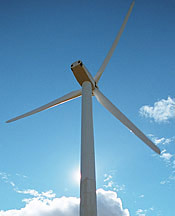 Eurus developed, built, and is now operating the wind farm located near Gail, Texas which is about 50 miles south of Lubbock. The wind farm is located on 60,000 acres of rangeland and consists of 180 Mitsubishi MWT-62/1.0 turbines each rated at 1MW. Eurus Energy currently has over 1,700MW of renewable energy generation in operation worldwide with over 500MW in the U.S.
“We’re excited to have achieved commercial operation of our first project in Texas and largest project worldwide to date. We are pleased with the performance of our BoP contractor, RES and turbine supplier, MPS, who both helped to make the project a success. We are also happy to be a part of the local community and to contribute to the local economy,” stated Mark Anderson, President and CEO of Eurus Energy America Corporation.